Hello and welcome to the newest Color Challenge for My Favorite Things. This weeks color challenge features one of my favourite coloir combinations - green, pink and aqua with some yellow added to the mix. 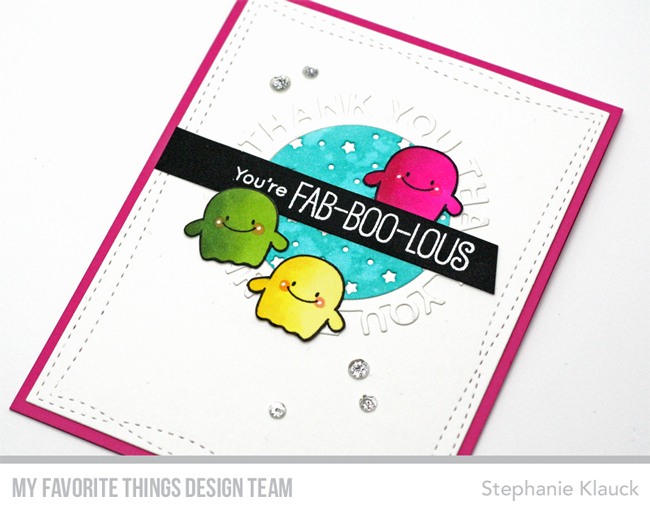 I decided to create a Halloween card since it's next week and I really wanted to use the Fab-BOO-lous Friends stamp set. I stamped my three ghosts onto white card stock and coloured them in with Copic markers for the green, pink and yellow of the challenge and I cut them out with my scissors. 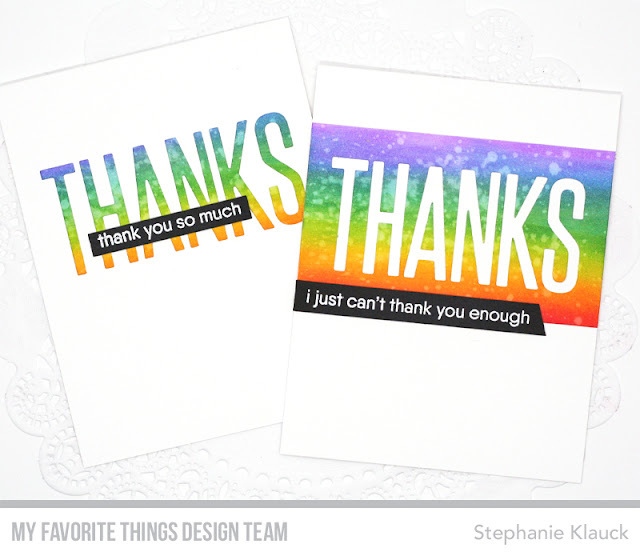 I then cut out the Thank You Circle Frame Die from white card stock and from a Starry Circle die cut that I had covered with Peacock Feathers distress ink for the aqua. I layered the die cut pieces onto a white card stock panel that I die cut with the largest Wonky Stitched Rectangle die and adhered the whole panel to a Ripe Raspberry card base. 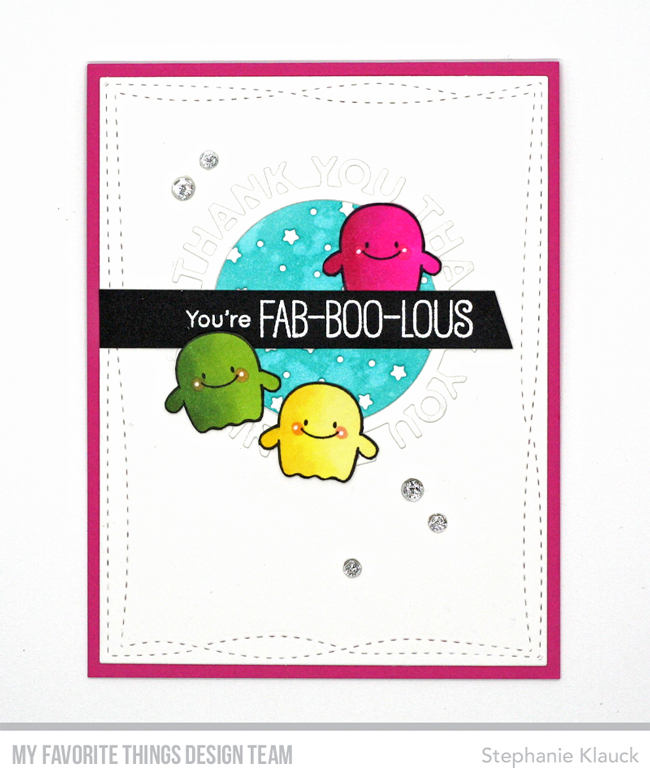 I added a black sentiment strip with a white heat embossed sentiment and completed the card with some clear sequins. Make sure to head over to the MFT Challenge blog to see more ideas using this color combination and to play along! Hello and welcome back. 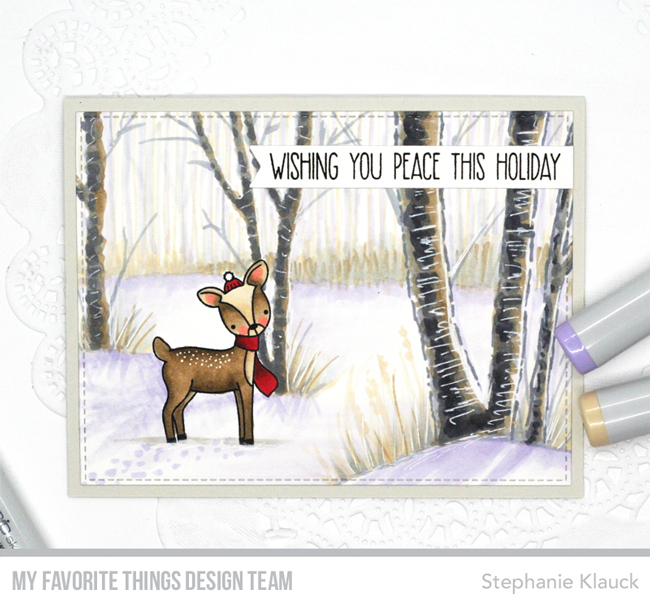 Today I have a card to share for the newest Wednesday sketch challenge at the My Favorite Things challenge blog. For my card I flipped the sketch upside down and added a sentiment and a stamped image for the design elements and then I created a background scene using Copic markers. I have really been loving creating my own scenes around my stamped images and I"ve been learning a lot of ways to do this through online classes. I first stamped my yeti from the Beast Friends stamp set with Cement Gray Hybrid ink and then I used my Copic markers to color him in. I decided to go with more of a gray look than white, so he would really stand out on the scene. I created my background based off of a Sandy Allnock class called Winter Wonderland and then I stamped my sentiment onto a white card stock strip and adhered it under the yeti. I diecut the whole panel with the largest A2 Sttiched Rectnagle STAX Set 1 die-namics and I adhered it to a Grout Gray card base. 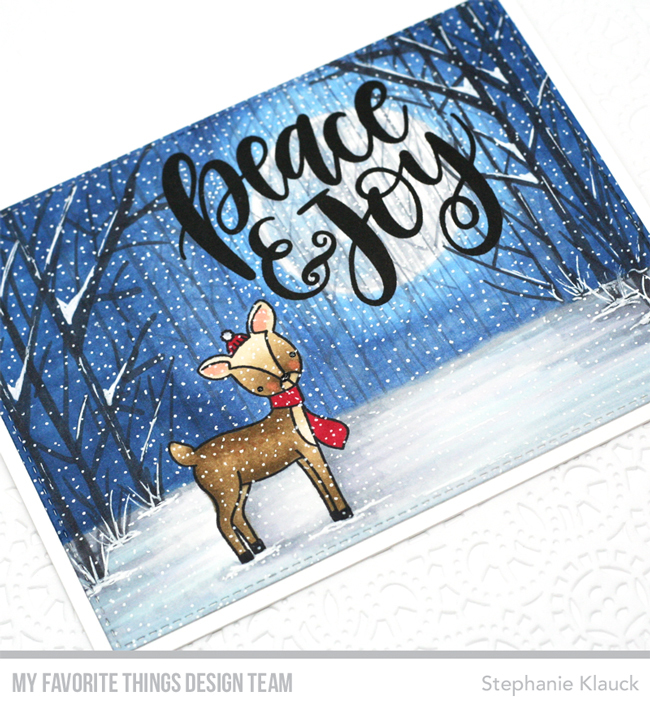 Make sure to head over to the MFT challenge blog to see some more card examples using this month's sketch and to enter your own card for a chance at a $50 GC to the MFT online store. 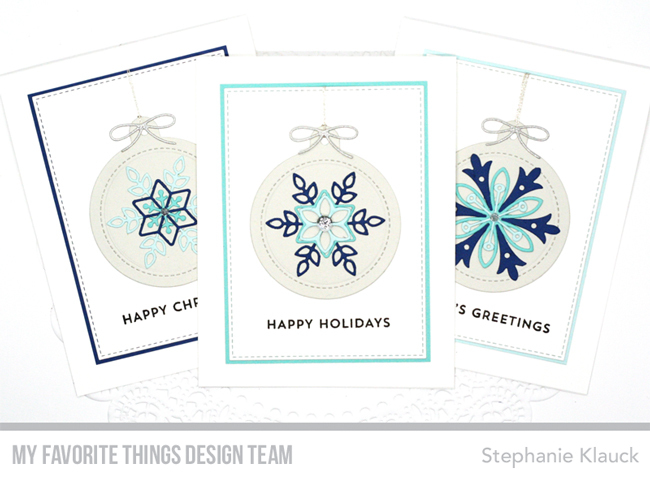 Snowflake Splendor Card Kit Release! Hello and welcome back to the My Favorite Things October card kit countdown. The new Snowflake Splendor card kit is now available in the MFT online store and tonight we're sharing more cards using this newest kit. For my card tonight, I used the Snowflake Splendor stamp set and created an entire stamped background that I heat embossed with white embossing powder. 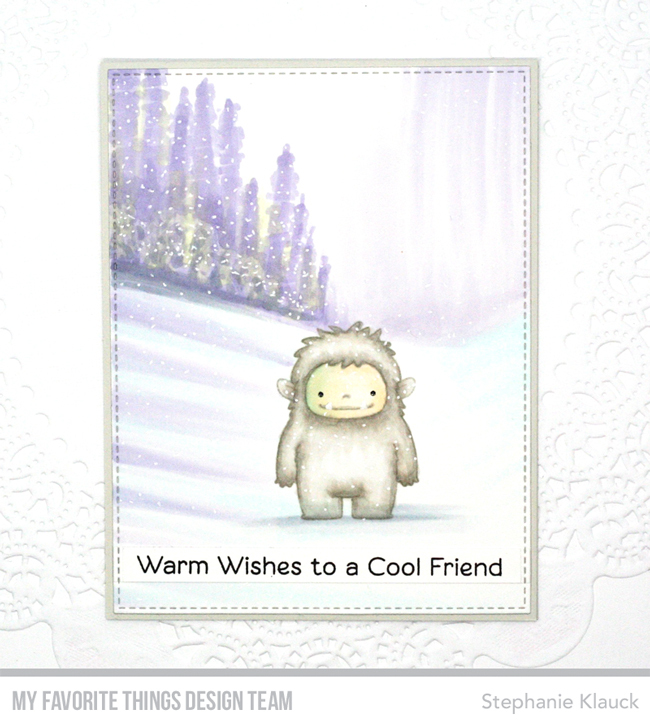 I then added distress ink to the background to create an emboss resist behind the snowflakes. Once the background was created I die cut the panel with a stitched rectangle die and then I added it to a Silver Sparkle card stock mat before adding it to a white card base. 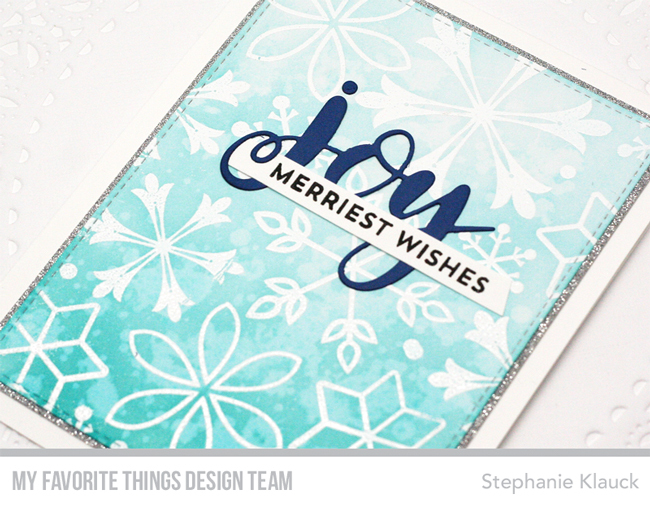 I stamped the Merriest Wishes sentiment onto a white strip of card stock and created a slanted edge on one end. I die cut the word Joy from dark blue card stock and then I adhered the stamped sentimetn strip tucked into the word. I adhered both onto the card front to complete the sentiment. 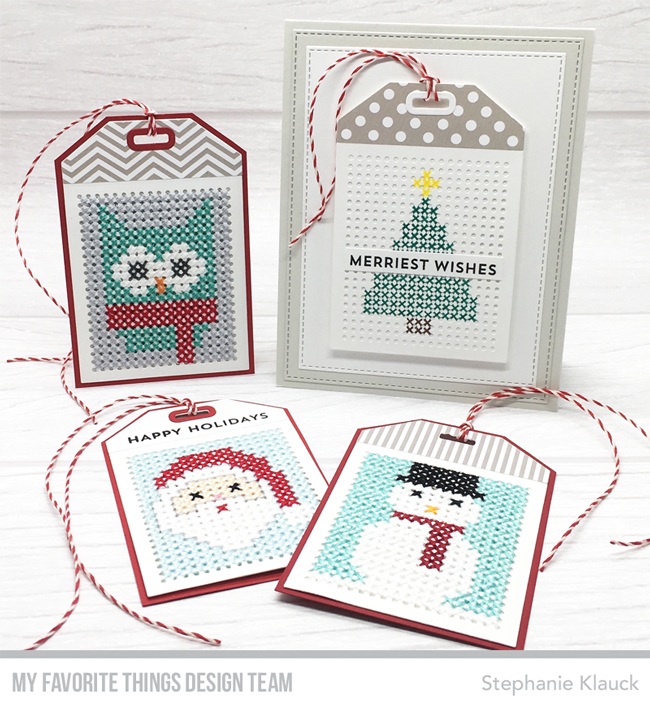 Make sure to head over to the MFT blog for more ideas using the new kit and a chance to win the giveaways. Thanks so much for stopping by today. 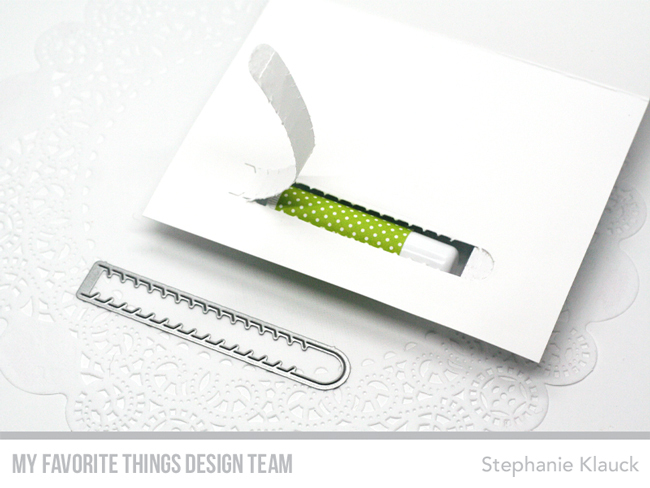 Hello and welcome back to the My Favorite Things October card kit countdown. For my card today I used the Layered Snowflake Die-namics to create a multi-coloured snowflakes that I adhered to a vellum window. To create the window I diecut the white panel using the Square Peek-A-Boo Window Die-namics and then I die cut the panel with the A2 Stitched Rectangle STAX Set 2 Die-namics to give it a stitched edge. Once I completed the die cutting, I added foam adhesive to the back of the panel, added vellum directly behind the window and adhered it to a Grout Gray card base. I created a layered snowflake with blue card stock and adhered it onto the vellum in the window using liquid adhesive. I added an aqua jewel to the center and stamped a sentiment directly under the window with Black Licorice Dye ink from the Snow Globe Sentiments stamp set. 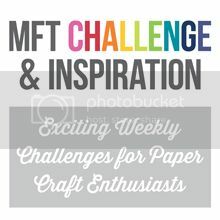 Make sure to visit the MFT Blog for more ideas using this months kit. I'll be back tonight with another card for the release party. 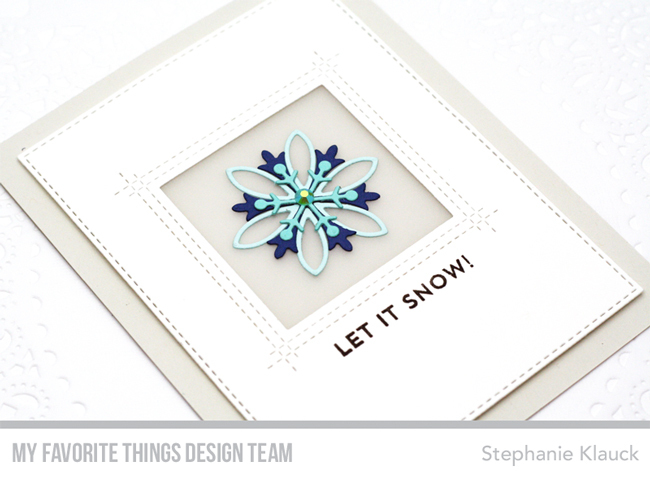 Hello and welcome to day 2 of the countdown to the MFT October card kit, Snowflake Splendor! 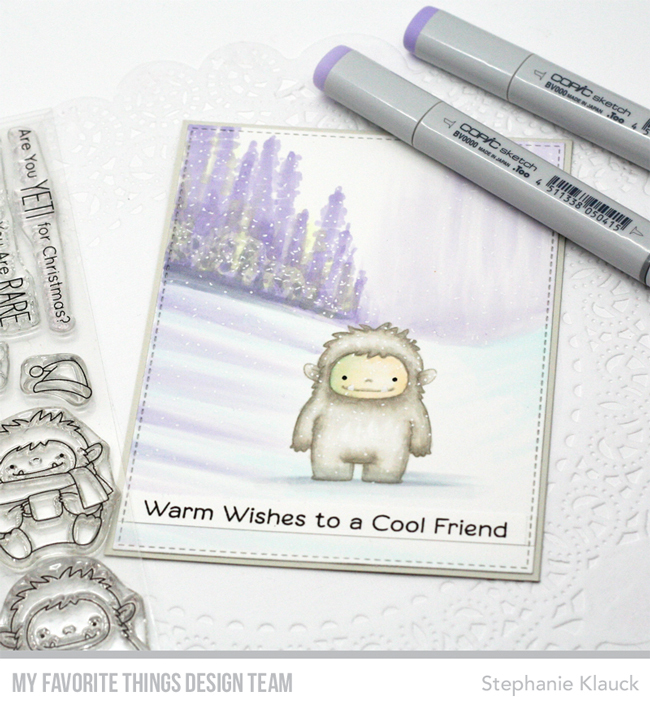 This months kit is all about winter and snowflakes with lots of layers. 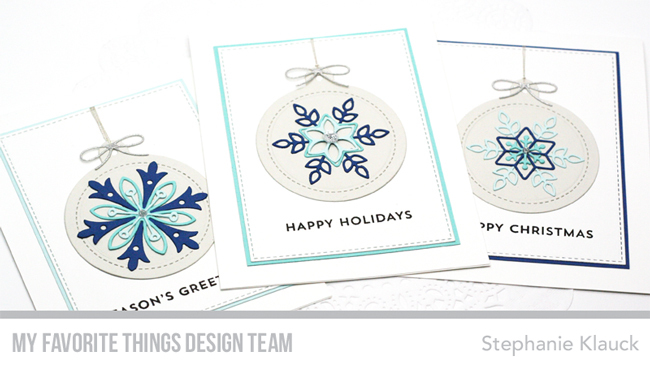 For my project today I created a trio of cards with the Layered Snowflake Die-namics from the kit and the Tag Builder Blueprints 6 Die-namics and created ornaments on my cards. 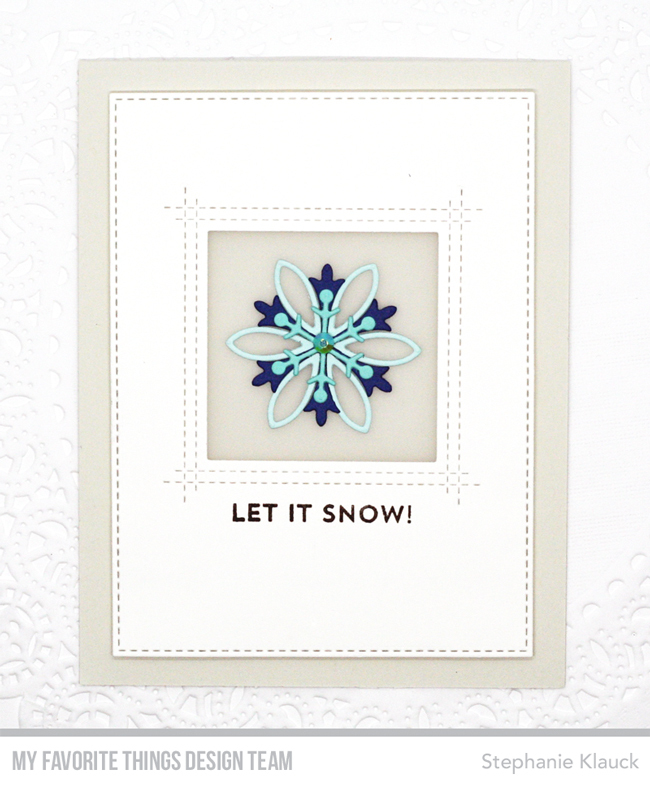 The Layered Snowflakes are so fun to create with because you can layer them in so many ways. I just cut out a bunch with 3 shades of blue card stock, and then I layered them together until I was happy with them. I created ornaments with the tag die cut from Grout Gray card stock and then added the layered snowflakes on top. I added sequins and Nuvo Drops to the centers and added a die cut bow to the top. I layered the panels onto coloured card stock and added them to white card base. You can see how I created these cards in today's episode of MFTv. Hello and welcome back. 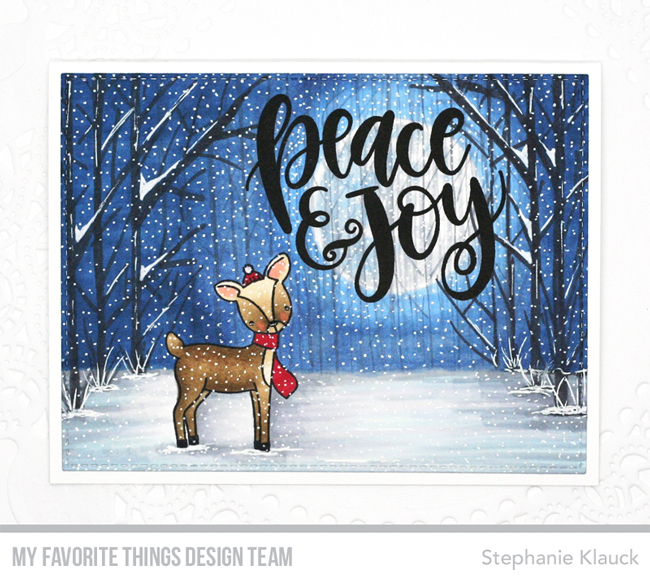 Today the My Favorite Things design team is revisting the October release and sharing some new projects using the newest release. I decided to create another winter scene using Copic markers, a stamped image and the techniques I've been learning in online classes. I love experimenting and creating scenes but I really want to start incorporating the scenes into card designs with stamped images. 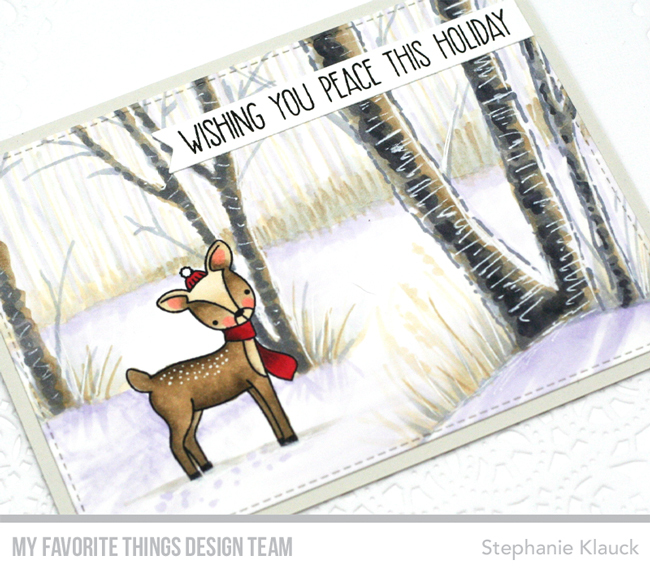 For today's card I stamped the deer image and then I created the scene around it. I stamped the deer with Black Licorice Hybrid ink and then I left it uncoloured while I worked on the scene. I created a wintery scene with birch trees and snow and when I was done I coloured in the deer imges to complete the scene. Once I had everything coloured I cut die cut the scene with the largest A2 Stitched Rectangle STAX Set 2 die and I added a sentiment that I had stamped on an Essential Fishtail Sentiment Strip banner. Make sure to head over to the MFT blog for more ideas using the October reease. Thanks for stopping by! Hello and welcome back! Today is one of the best days of the year - World Card Making Day! It's a day where we get to come together as card makers and celebrate this hobby, create cards and just spend the day getting crafty! Who doesn't love that! 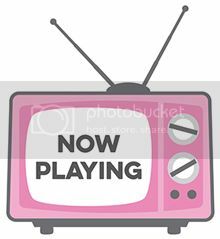 We are celebrating the day over at the My Favorite Things blog with challenges and giveaways all day long so make sure to head over there so you can play along! 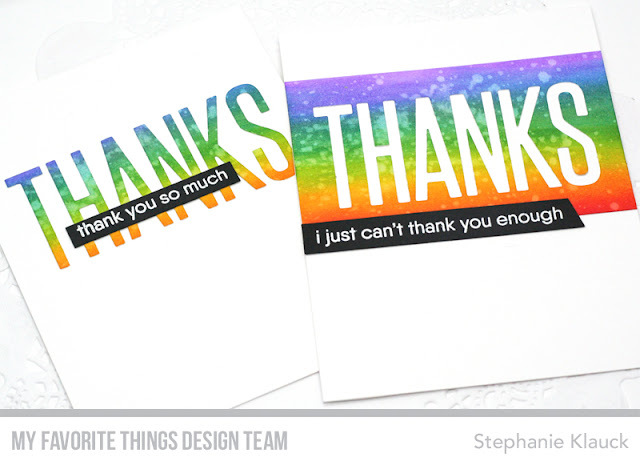 I used Distress inks, the Big Thanks Die-namics and the Grateful for You Stamp Set to complete my cards for this first challenge. I can't wait to see what all of you create! Hello and welcome to this week's Wednesday Sketch Challenge. I always love using an MFT sketch as a starting point on my projects... it takes a lot of the guess work out of the overall design and just let's me create. I have been taking a lot of online Copic classes and really trying to learn how to use my markers to their full potential so I decided to create a card with a background scene created entirely with my markers. 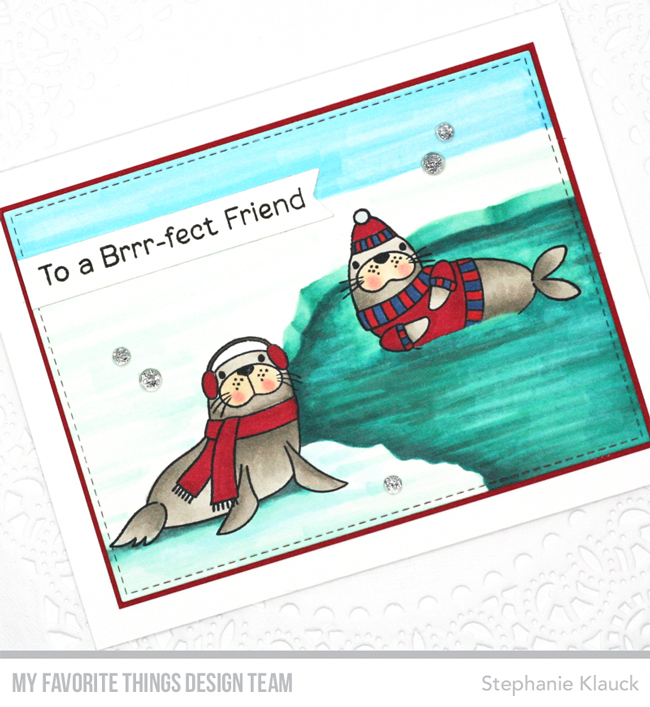 I was inspired by a card that Sandy Allnock created with an icy lake and decided to try and re-create the look on my card with the new Polar Pals stamp set. I stamped my images onto a white piece of card stock and when I stamped the seal in the water, I removed some of the ink from the bottom of him before I stamped him so it looks like the lower half of his body is in the water. Once I had them stamped, I created the scene around them with my Copic markers and then I coloured in the seals last. I don't love the blue colour that I used for the sky but I really like how the water in the icy lake turned out so I'm glad I tried it out. Next time I think I'll use deeper blues for the sky and make the water a little brighter. Thanks for joining me for this week's sketch. 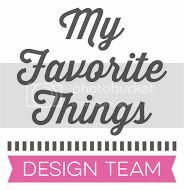 Make sure to link up your card at the MFT challenge blog here for a chance to win a $50 GC to My Favorite Things! My Favorite Things October Release Party! Hello and welcome to the My Favorite Things October release party! Tonight we're celebrating the release of the new holiday products that we've been sharing all week - all of the new products are in the store and available for purchase! Yay! 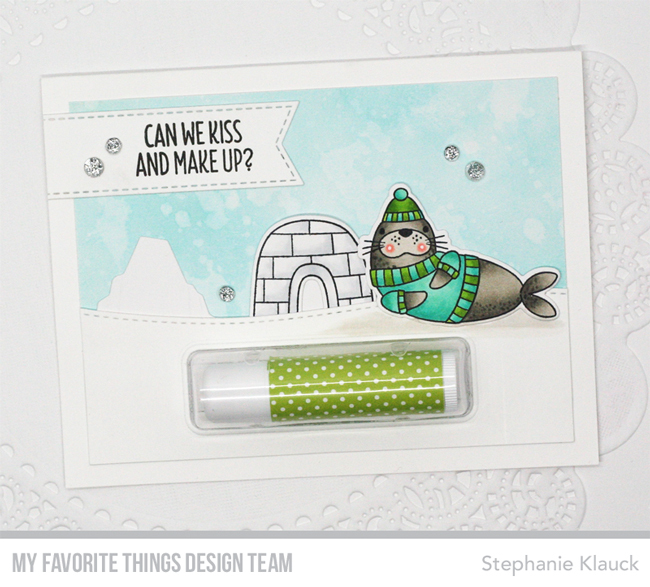 For my card tonight I used the new Lip Balm Window & Frame Die-namics along with the previously released Essential Sentiment Rip Strip Die-namics to share how you can create a lip balm project and not have to completely take it apart to get the lip balm out. 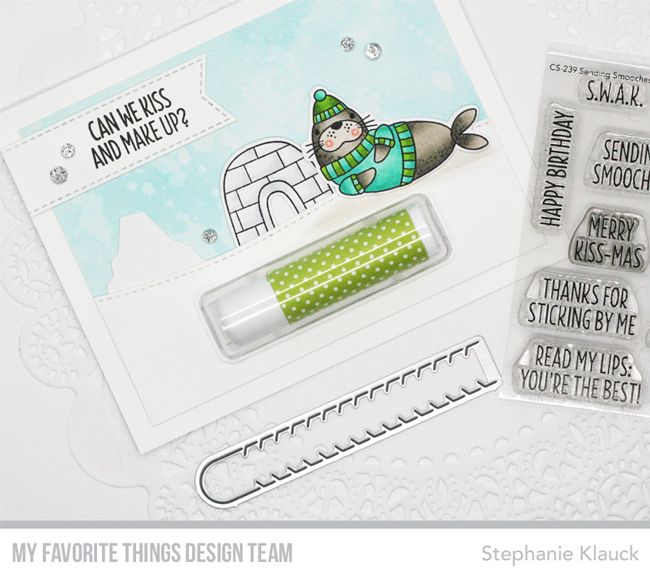 I created a winter scene on the front of my card with the Polar Pals stamp set, the Icebergs Die-namics and a sentiment from the Sending Smooches stamp set, stamped onto a Stitched Fishtail Sentiment Strip banner. I diecut the Lip Balm Window from the snow area and adhered my Lip Balm pouch inside to hold my coordinating lip balm that I made with patterned paper. To be able top easily get the lip balm out, I used the Essential Sentiment Rip Strips Die-namics and die cut it into the front of the card base before adhering my panel. Just make sure to die cut it directly under where the lip balm window is. I created a video sharing how I created this card and you can watch it HERE if you want to see how I put the card together. Hello and welcome to day 1 of the My Favorite Things October release countdown. All of the new products we've been sharing this week will be available tonight at 9pm EST! For my card today I used the Christmas Cocktails mini stamp set, which is actually a free with purchase set. It has some really fun cocktail glass images and I couldn't wait to ink it up! 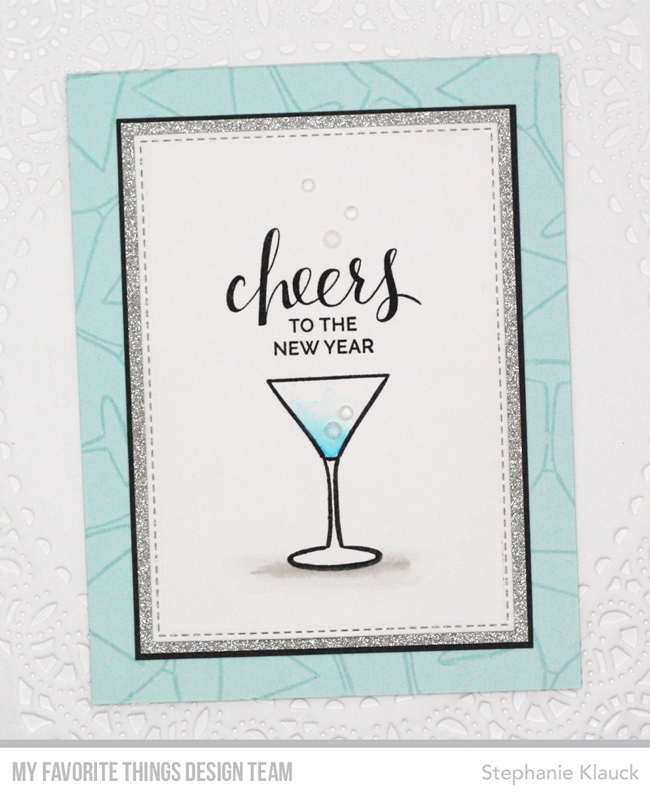 I wanted to make the martini glass the focus of the card, so I stamped it onto white card stock with black ink and added a bit of colour to it with some watercolour. I stamped the sentiment from an older stamp set called Hand Lettered Holiday above the glass - I love how it looks like it's coming out of the glass with the jewel bubbles that I added. I added the panel to some silver sparkle card stock and some Steel Grey card stock and then I added the finished panel to a Sno Cone card base. 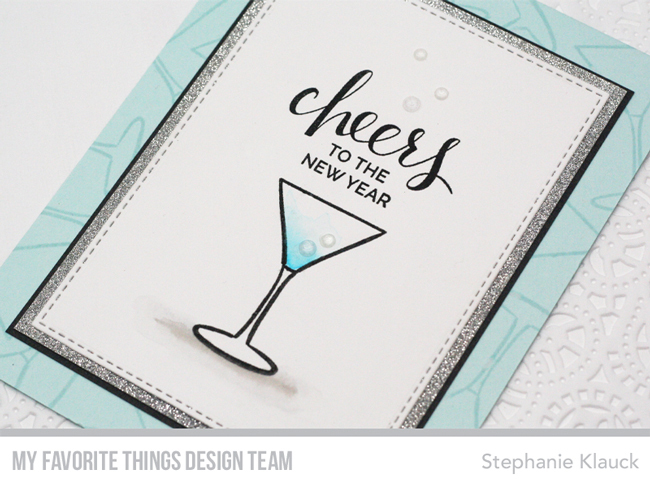 For some added interest on the card base, I stamped the same martini glass with the same ink colour for a tone-on-tone look. Thanks so much for joining me for day 1 of the countdown. I'll see you tonight for the release party. 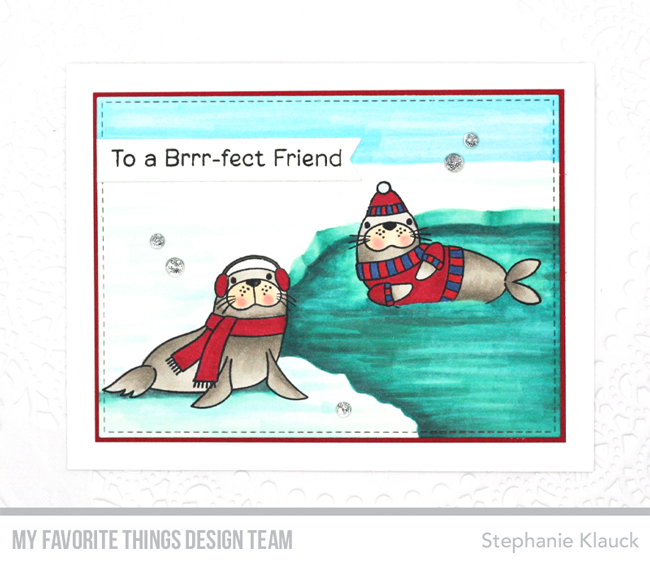 For my first card I used the new Handwritten Holiday stamp set (the sentiments in this set are gorgeous!) and I created a winter night scene to add the sentiment to. 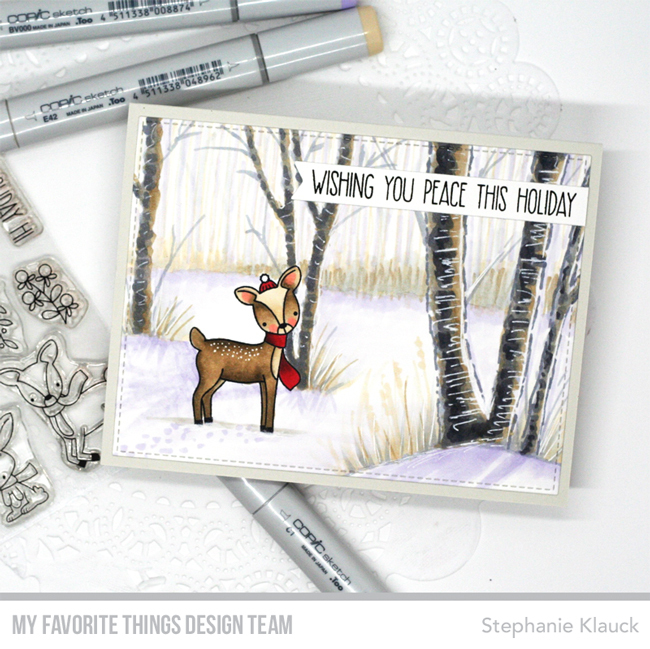 I first stamped the deer image from the new Dashing Deer stamp set onto a panel of white card stock and then I built the scene around him using Copic markers. I have been taking a lot of online classes to improve my Copic colouring skills so I used what I've learned so far to create the night backdrop. I created the moon first and then added the night sky around it. I then added trees and the snow detail on the ground and completed the scene by colouring in the deer and adding all of the snow detail with a white gel pen. Once I had the scene complete, I added the sentiment right over the moon area using black ink and my Mini Misti stamping tool to ensure that I got a really bold, dark sentiment. For my second project I used the new Cross-Stitch Tag die to create a few hand stitched tags and a card that looks like it was stitched but was actually done with pencil crayons. Hello and welcome back to the My Favorite Things October release countdown. 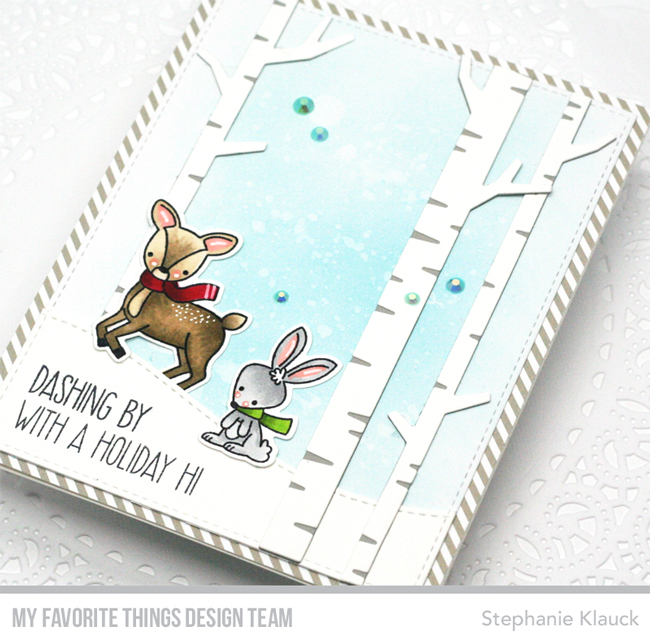 Today we're sharing projects created with the new Dashing Deer stamp set and the snow globe collection that was a part of the previous card kit. For my cards today I used the new Dashing Deer stamp set and created two winter themed cards using the adorable deer images from this set. 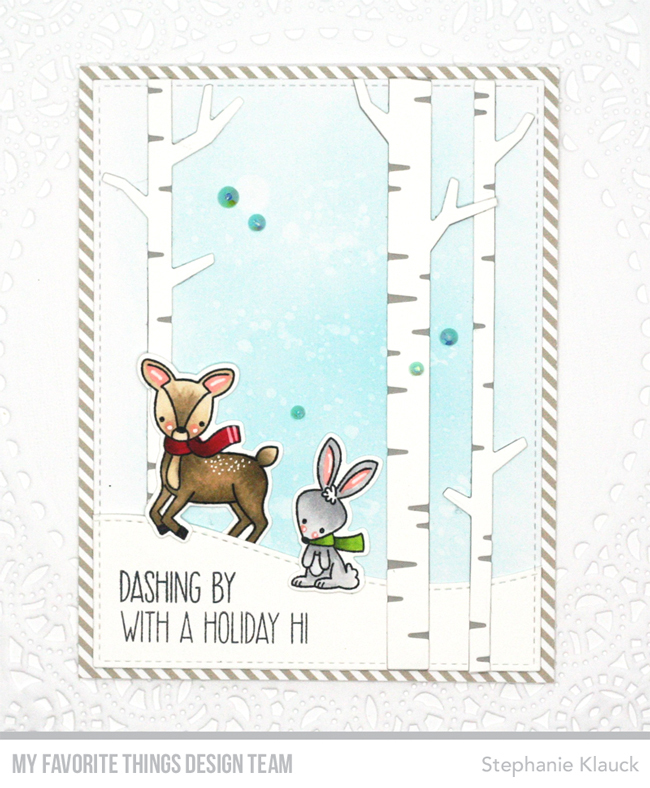 For my first card, I created a winter scene using the Birch Trees dies and one of the deer images along with the cute bunny image from the stamp set. 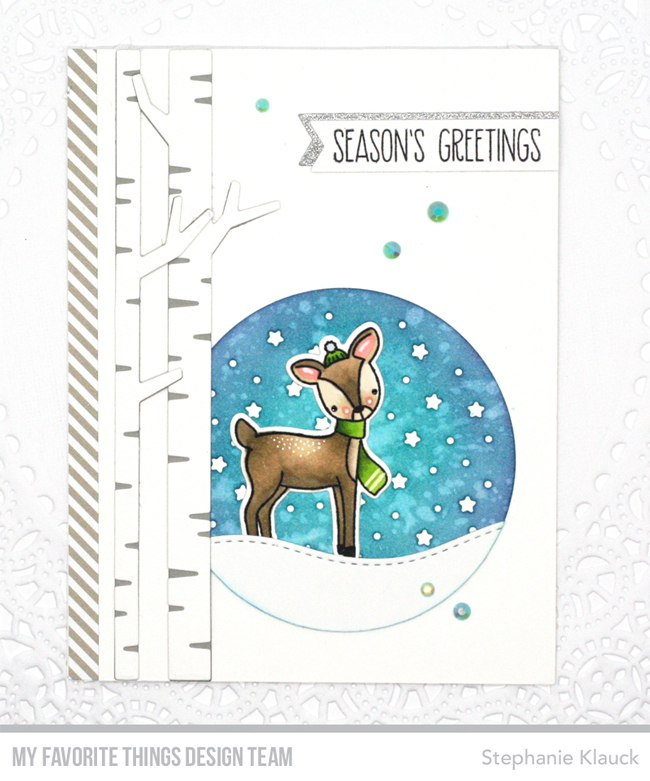 I created the scene with an inked background, and then I added the birch trees and a snow hill that I die cut using the Stitched Snow Drift Die-namics. 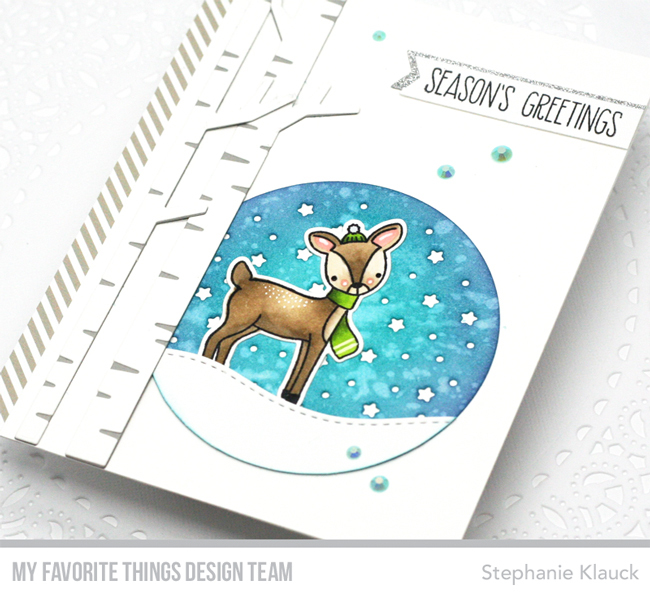 For my second card, I used the other deer image and created a scene using the Starry Circle Die-namics. I love creating a scene on a circle element. I adhered the birch trees to the side of the scene and added the sentiment to the top right of the card stamped on a sentiment banner. Thank you so much for joining me for day 3 of the countdown!